Here at American Garage Door and Gate Systems in Colorado, our goal is to provide our customers with exactly what – custom wood garage doors that fit their style and budget. Our goal is to make sure every customer feels heard and knows that they got a great deal on a first-rate garage door. That’s why we offer such a wide range of options, styles, and colors. 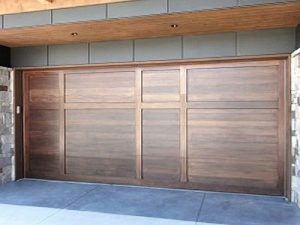 Let’s take a look at some decisions you’ll be able to make when choosing custom wood garage doors. You can choose to add glass to your door, which is a great way to let additional light into your garage, particularly if your garage doesn’t have other windows. We have options for insulated, tempered, textured and even colored glass. Of course, windows can come with a security risk. When people can see inside your garage, it makes it easier for thieves to see what they want and know when you’re not there. For added protection, we offer six options that obscure the interior of your garage while allowing daylight in. Click here to see photos of our obscured, reeded, glue chip, rain, seeded and satin glass. Decorative hardware is an excellent way to add a personalized touch to your garage door without getting too expensive. With so many different colors and styles to choose from, you can mix and match to create the perfect look for your home. To add a sharp, finished look to the interior of custom wood garage doors, consider going with a powder coating for the track and hardware. Just pick out the right finish, and we’ll add it to the door’s hinges, track, support struts and all the other miscellaneous metal parts for a truly professional look. Of course, the stain and finish that you choose drastically affect the look of your garage door. We have a variety of colors to choose from, so you’re sure to find a perfect fit. We also only use the highest quality in stains and finishes to keep your investment well protected and looking like new for many years. Be sure to check out our website or stop by and see all the options we have available for custom wood garage doors. You really can’t fully appreciate all the options we offer until you see it for yourself. Serving customers across the Front Range in Colorado since 1974, we’ve learned what works, what doesn’t and what our customers are looking for. That’s how we’ve created such a quality collection of garage door products for you to choose from. We carefully research each company until we feel confident that their products are something that we can stand behind. When you choose custom wood garage doors from American Garage Door and Gate Systems, you can trust that you’re getting expert advice and a quality door that will enhance the beauty of your home. Call or contact us today for a free estimate and let’s get started on creating your perfect garage door.